Olivia Newton-John and Deborah Hutton collaborate to give you some insight into how to manage menopause and the next stage of your life with style, poise and grace. This on-line comprehensive support program developed in conjunction with the award-winning Gaia Retreat and Spa offers an alternative path to not just surviving but thriving through menopause. In this course, Deborah Hutton interviews Gaia practitioners, therapists, counselors and medical doctors to discuss all the frequently asked questions about menopause, the symptoms, and the solutions. Together we explore the alternative options for dealing with the hormonal effects on the body and how to approach aging and the third major stage of a woman's life with grace and poise. Get step by step guidance: Deborah Hutton guides you through the minefield of information about menopause, finding out what's myth and what's fact. Join a community movement: Ever felt you are alone on this journey? Learn from other like-minded women. Learn from the experts: Our coaches are experienced therapists and practitioners with 20+ years in the industry of wellness and healing. "Uplifting stories, suggestions & inspirational. "Omg. This is so wonderful and is a huge contribution to me." Over three days at GAIA I sat down with all the key experts and went head on into the topic of menopause, trying to unearth all the mystery that surrounds menopause, and more importantly find the solutions that will enable us not to fear it but instead embrace this important time in our lives. To my amazement, I came out enlightened, empowered and quite positive about how we can personally approach this stage of our lives. I learned that we can be incredibly proactive and to some large extent control the seemingly uncontrollable mid-life change. So I’m over the moon that with GAIA we are able to finally launch this amazing program to help so many of you out there that are looking for answers on managing your menopause journey. I’m not aware of any other program like it and I feel incredibly proud to be able to offer it. Would love to hear your thoughts? What if I'm too busy to find time to take the course? Life is busy, that's why we've made this course super easy to access and digestible in small, short video sessions. You also have 12 months to dip in and out at your leisure. We will send you reminder emails weekly for 12 weeks but how and when you view the lessons is entirely up to you. Just let us know within 7 days of sign up and we will refund your purchase. Women who want to understand the secrets to aging well, navigating the next stage of life with grace and poise. Knowledge is powerful - the more you know, the easier it is to manage your expectations, so this course is for pre-menopausal and menopausal women alike. Empowered, inspired and excited about the next phase of your life. You might already know the mechanics of menopause but hearing the Gaia therapists talk about this transition and their strategies for thriving will inspire you to embrace this wonderful phase of life. 5 modules covering physical changes, emotions, relationships, wisdom and therapies. Dr. Inga's focus as a General Practitioner is on an integrated holistic approach to patient care which is founded on her medicine and science degree with a sub-specialty in Ayurvedic medicine. Over a number of years, Dr. Inga gained a solid foundation in nutritional and environmental medicine and the use of bio-identical hormones. She now enjoys working as part of a dedicated team at the Bangalow Medical Centre, committed to caring for the health of our community and to a wellness approach to patient care. Danielle has been studying and practicing yoga for over 17 years. She teaches yoga, Pilates Dynamic Stretch, Pranayama (conscious breathing), and meditation. She is a passionate wellness advocate and women's motivational speaker. Naomi has worked in the health and spa industry for over 15 years working as both a therapist and manager. She is passionate about health and incorporating various modalities including nutrition, movement and emotional work to bring people closer to their wellness potential. Angelika has been working in the health industry for 33 years and comes from a Nursing background. She continuously expands her knowledge in natural healing methods and has a passion and qualification for Manual lymphatic drainage. Leanne has worked in the hospitality industry for the past 15 years in managerial position. She is passionate about customer service and prides herself on her ability to communicate with guests on any level, guiding people to achieve their perfect stay. With a Bachelor of Health Science and Complementary Medicine, and Advanced Diploma of Naturopathy (BHlth Sc. ND. ), Grace has over 13 years experience practicing as a Naturopath and uses a holistic approach towards health and healing. Bringing over 30 years experience in beauty therapy and ongoing study of energetic awareness, Nicolette's professional, ethical and attention-to-detail approach gently cocoons her clients' body, mind and soul with love (stillness+joy+harmony). The internationally recognised multi award-winning Gaia Retreat & Spa is nestled on 25 acres in the breathtaking Bundjalung Country hinterland of Byron Bay, the region known as the healing heartland of Australia. 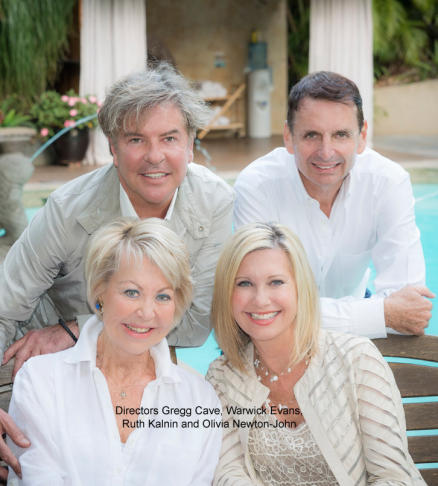 Founded in 2005 by Gregg Cave, Ruth Kalnin, Olivia Newton-John and Warwick Evans, aptly and affectionately known as G.R.O.W, the team set out to realise a shared dream to create a place of heart where you OWN the experience – a place to refocus, rebalance and truly restore. Gaia offers a selection of Specialised Packages for wellness, weight loss and relaxation. With 14 treatment rooms and over 35 outstanding healers and therapists, the Gaia team are the specialists in nurturing with integrity and heartfelt passion to enliven and balance your being.